Brazil has unveiled the tournament’s Official Poster for the 2014 FIFA World Cup. 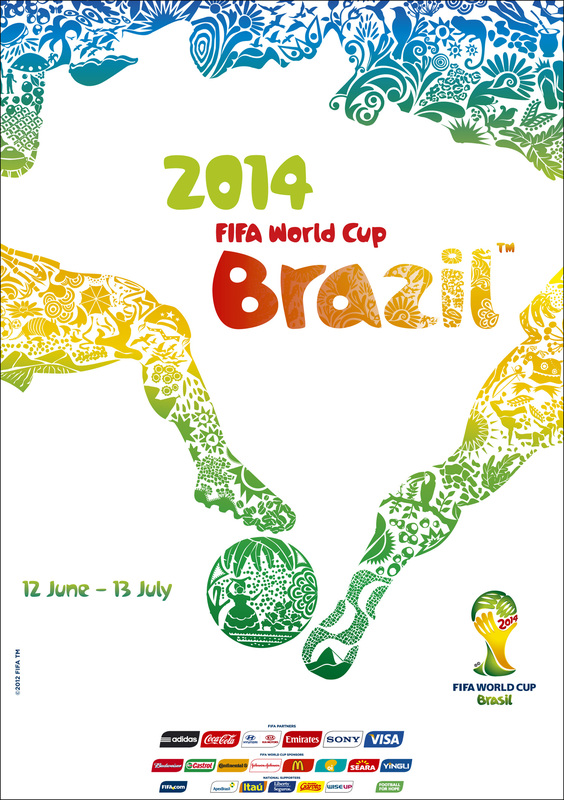 The Official Poster was the last remaining visual icon to be launched for the 2014 edition of FIFA’s flagship event. “The poster is a great example of Brazil’s creative excellence. The winning entry will no doubt serve as a splendid visiting card for the 2014 FIFA World Cup, that is due to kick off in 498 days. The poster highlights the significance and sparkle of the event as well as the fascination of football in a very emotive way”, explained FIFA Secretary General Jérôme Valcke , who was part of a high-profile judging panel also made up of Brazilian Minister of Culture Marta Suplicy, LOC President Jose Maria Marin, Brazilian artist Romero Britto as well as LOC Board of Administration members Ronaldo and Bebeto. “It’s different, Brazilian, creative and daring. It has our boundless size and manages to capture our rhythm and colours. Let’s go for victory!” said Marta Suplicy, Brazilian Minister of Culture. The Official poster was designed by Brazilian creative agency Crama, which was selected ahead of two other designs. “The Official Poster is an important step for showcasing Brazil and the FIFA World Cup in the Host Country and abroad. It is important to convey the message of a country that is modern, innovative, sustainable, happy, united and, of course, passionate about football,” explained Ronaldo. The artwork depicts the beauty and diversity of Brazil through a colourful, emotional and vibrant design. The creative concept at the heart of the poster is “An entire country at football’s service – Brazil and football: one shared identity”, which inspired Crama to shape the winning design. This is evident throughout the poster, particularly where the players‘ legs challenging for the ball reveal the map of Brazil.